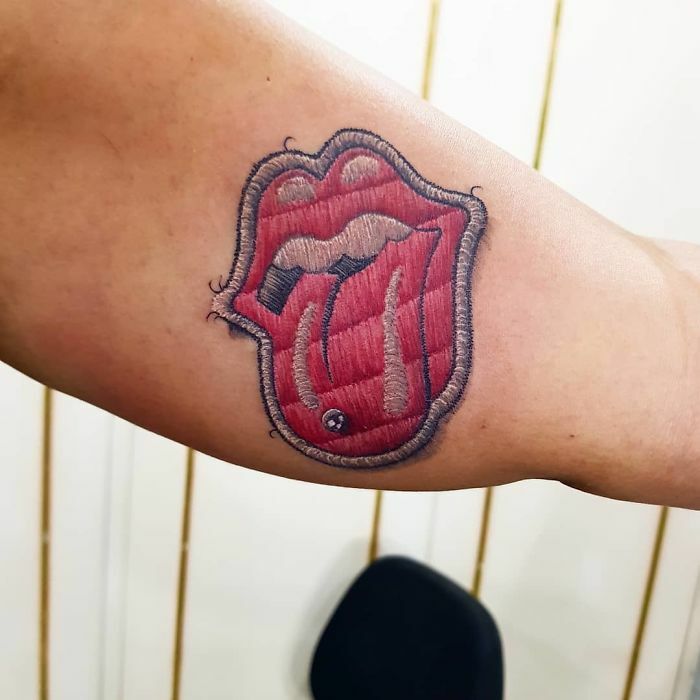 When it comes to tattoos, trends can be a little bit dangerous. There was a time when everyone had a tribal tattoo. There was a time everyone had a dolphin design. And now, there’s a new trend. But we trust in this one, because it’s not only as cool as you can get. It is also beautiful. 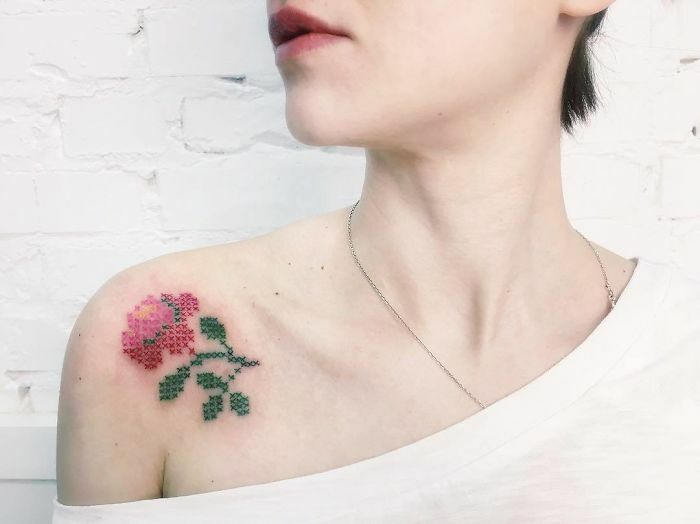 We are talking about incredible, detailed tattoos that look like they’re embroidered on your body. Your grandma will scream at first but be amazed when she sees it carefully. We’ve gathered some pictures so you can get an idea. Take a look, we’re pretty sure your next tattoo is right here. Well, this is amazing. It takes me back to my childhood, like an impressive homage to my grandma and her handmade blankets. It also has some native american vibes, don’t you think? 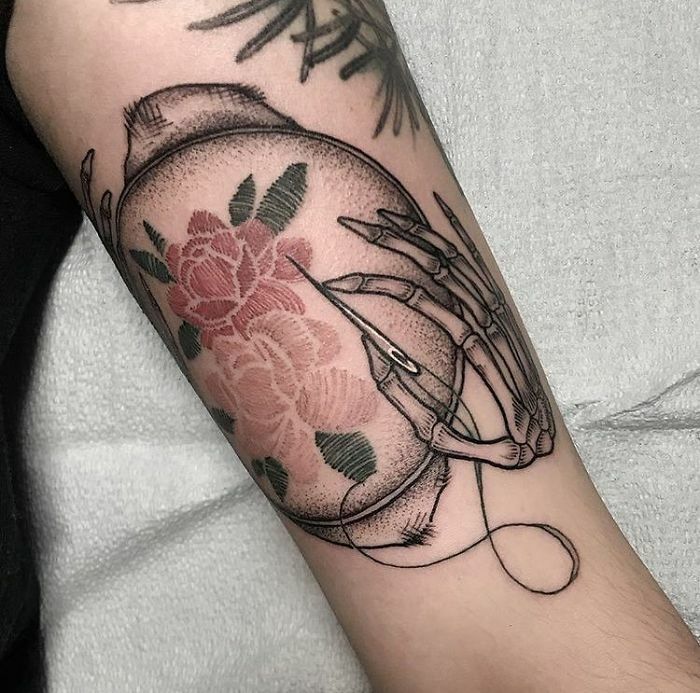 If you look at this one really close you can see an incredible detail: Shiny silver-like threads, that give this tattoo the impression of a real embroidery. Imagine having to draw this design, full of tiny little threads, shadows, details and color. 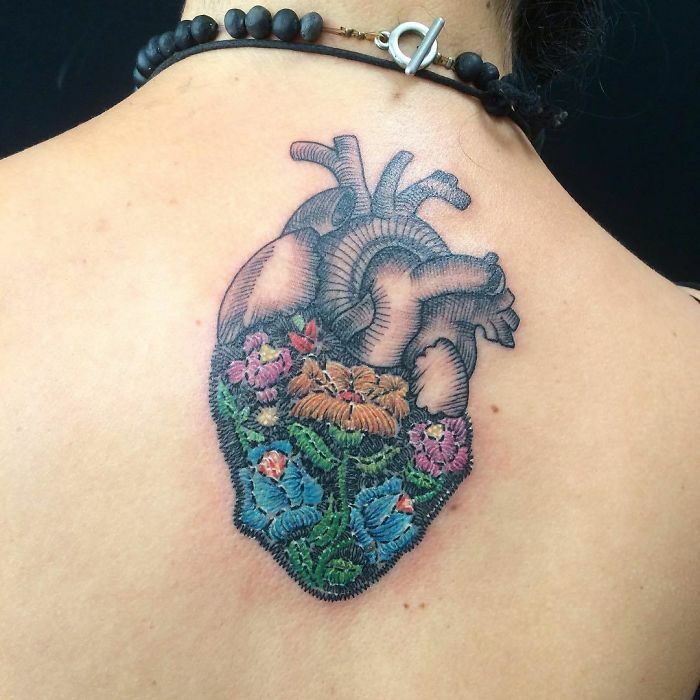 I think this is one of the most incredible tattoos I’ve ever seen. I’m sure you thought this was one of those patches you stick to your denim jacket, but it is not. 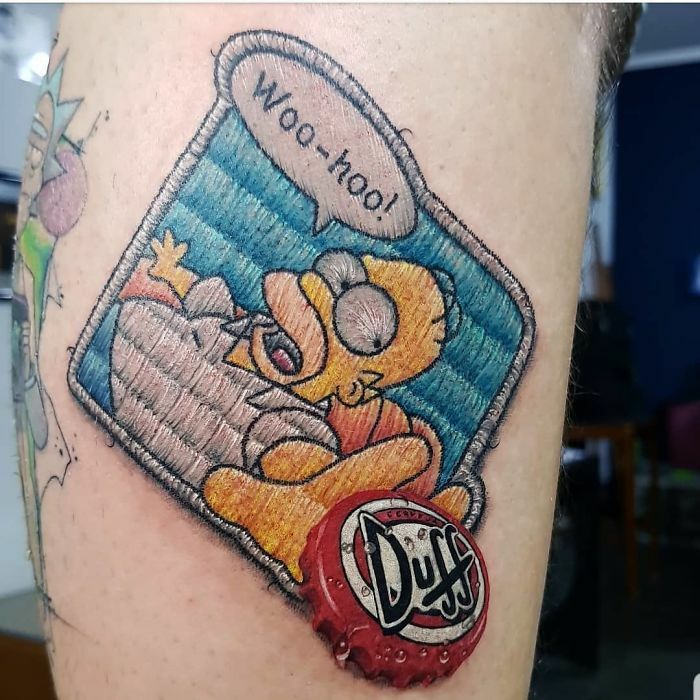 It is a tattoo, for real. Someone thought this out and drew it like a champ. This has some Eastern-Europe vibes, and we love it. 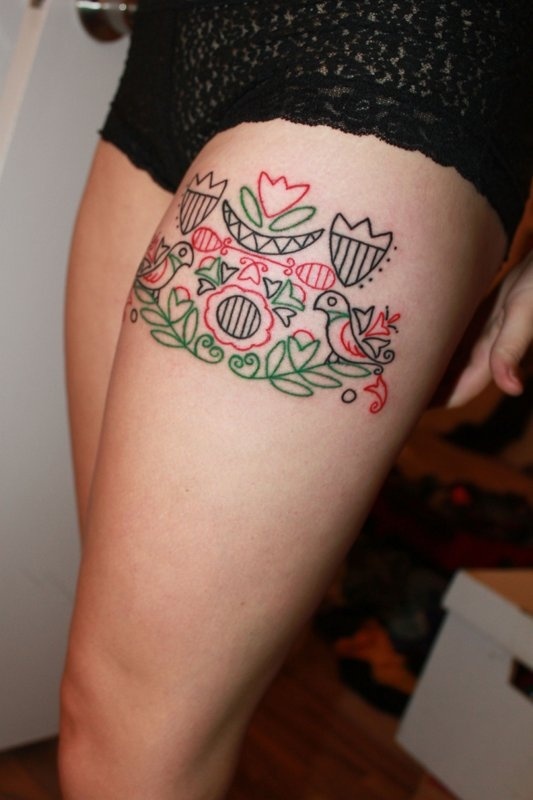 It’s a cool design if you want to have a tattoo full of history, tradition and beauty. It took me a while to find out if the cap was part of the tattoo or a real one, and it is part of the design! The combination of the embroidery of the patch and the realistic look of the cap makes the tattoo even cooler. This thing is out of this world. I can’t even believe someone is so talented to do this. It has a tridimensional look that makes you doubt if she has a tattoo or a patch stuck to her back. 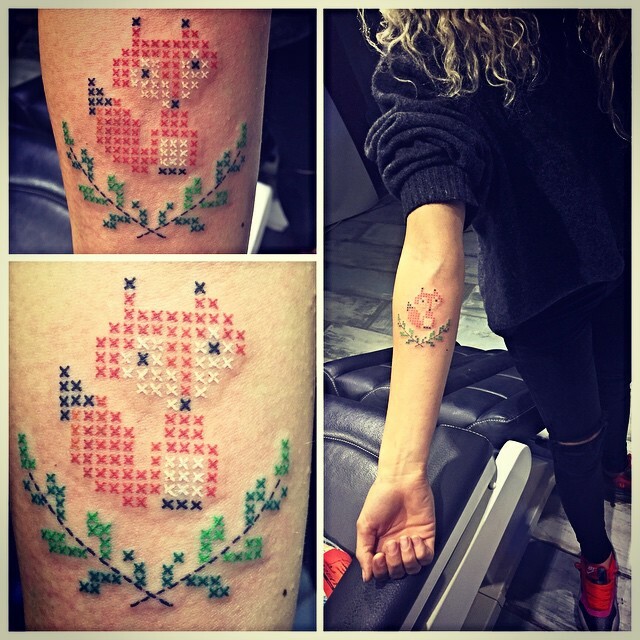 This is a cool idea if you want to make a cute design and you don’t want something too big, or maybe if you don’t trust your tattoist that much. 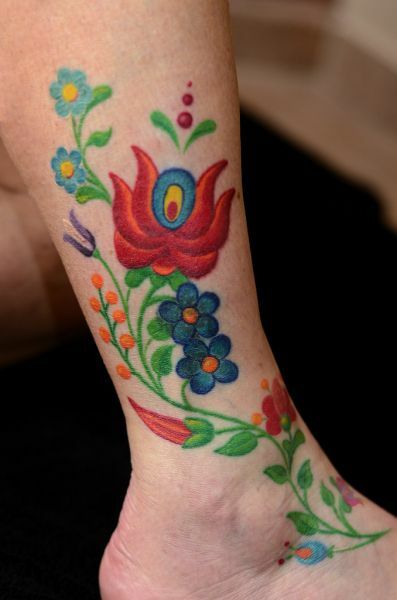 Are you a seamstress or a clothes designer looking for a great tattoo? Then look no more. This one is the best design you can get. It’s funny, it’s cute, and it’s just for you. Ukraine is known for the beautiful patterns that you can find in all kinds of fabrics. 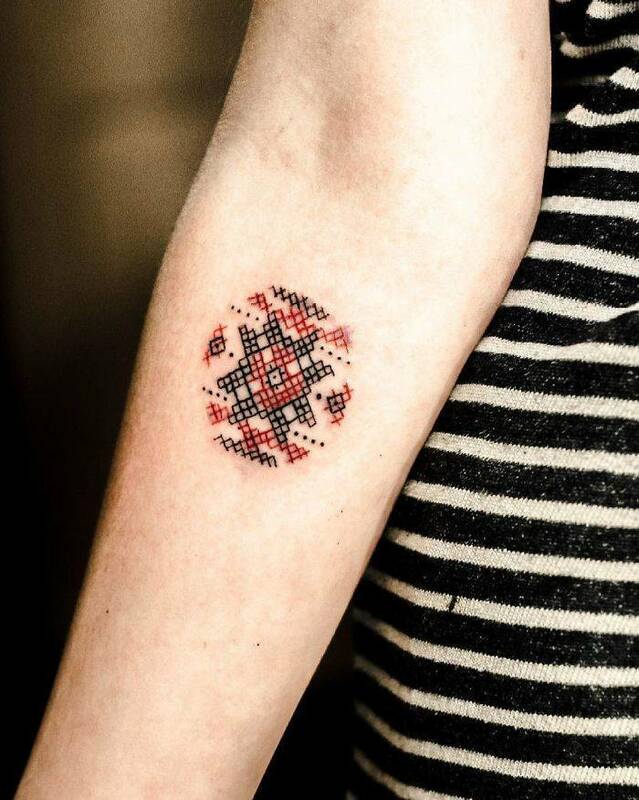 If you have Ukrainian roots you want to pay homage to, or you just like this type of patterns, then this is a tattoo just for you. Look at those details. This design is so beautiful and so original. 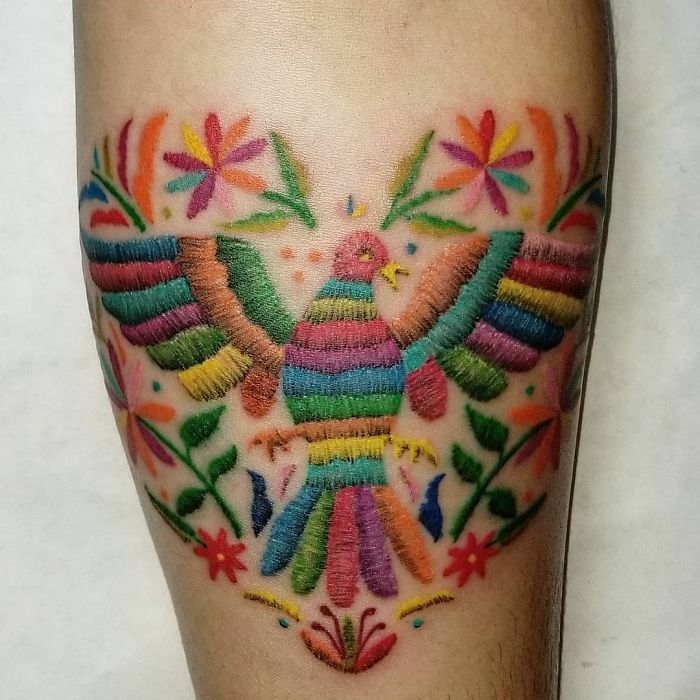 It has strength and power, and the combination between a classic tattoo and the embroidery is just great. 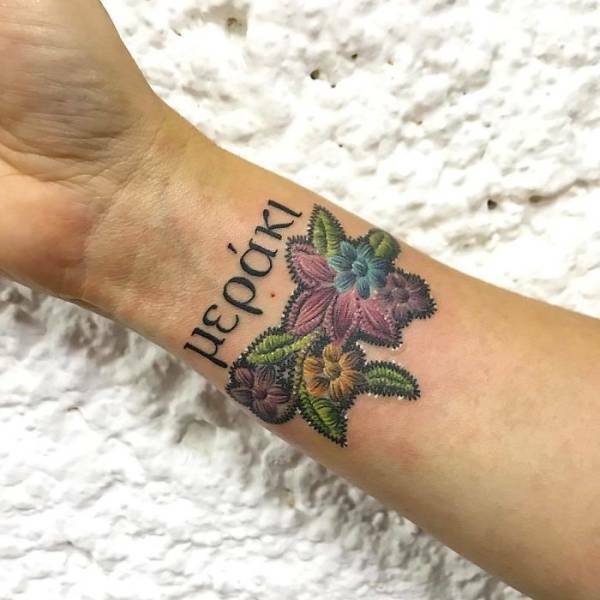 I’m not sure if the letters are part of the design or if they are two different tattoos, but does it really matter? The combination between both things is incredible. This is a cool idea, but I admit it is not for everyone. A skeleton hand embroidering a beautiful pattern, that is also a tattoo. It sounds tricky, but it looks incredible. You can’t deny these people have a perfect pulse. Those details are incredible. If you look closely, you will see tiny loose threads on the outline. Tattooing this kind of designs can’t be easy. Look at those shiny threads, that combination of colors needs to be done with extreme care. The shadows, the loose threads, that realistic piercing, the lines in the middle, it is all a collection of details that delivers an incredible design. You don’t need to be a Rollings Stones’ fan to realize that. In Hungary, embroidery is an art and a form of living. Each region has its style, and this tattoo summons the best of them all. It’s a neat idea if you don’t want something too detailed. It takes courage to decide a tattoo design and it takes a lot of Courage to choose this one. 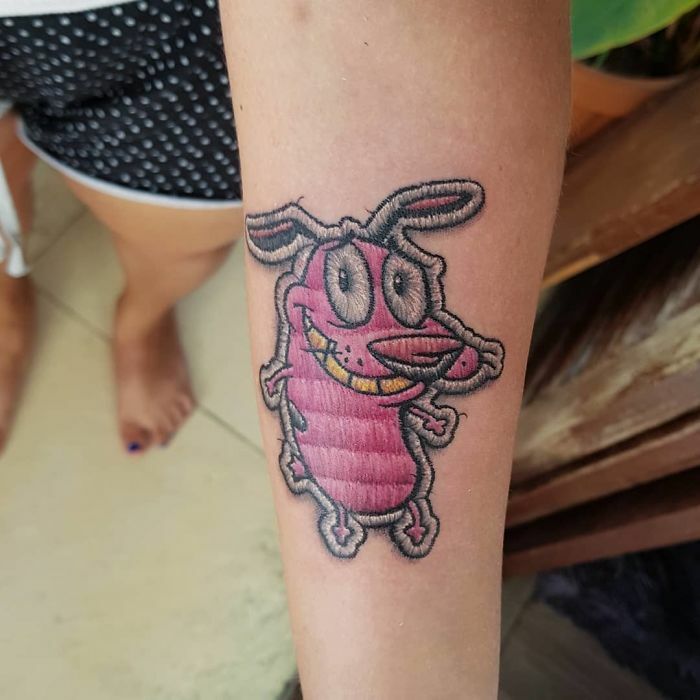 All you nineties kids will laugh at the memories of Courage, the Cowardly Dog. It’s not that easy to make a piece of art that looks easy to make. And this tattoo artist achieved that. The visible crossed stitches, the color combination, it all works out incredibly. This one is not so detailed, and it’s quite childish, but we can’t deny that it is beautiful. 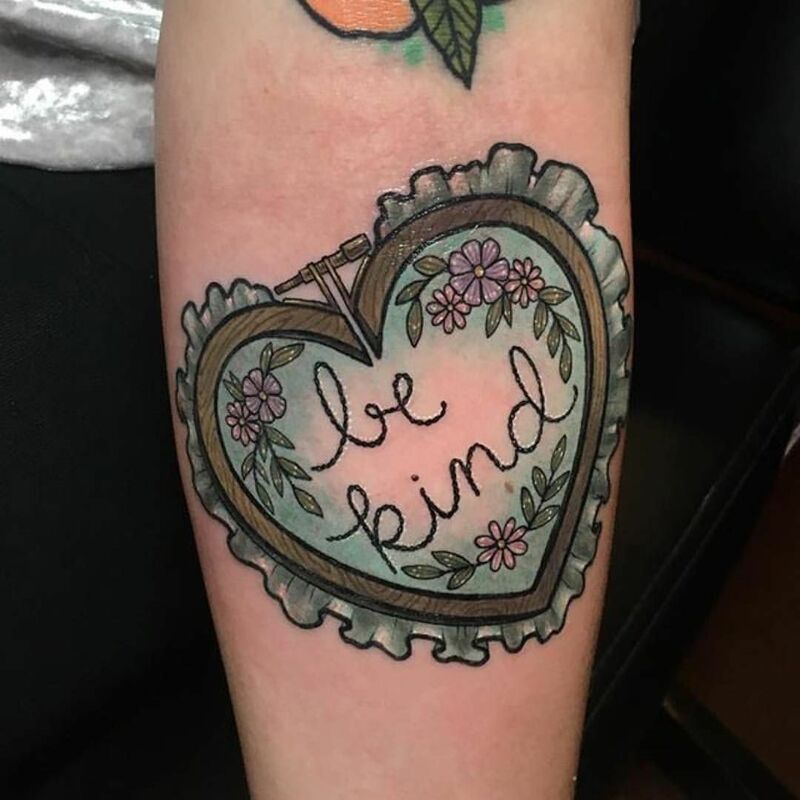 It’s an excellent idea for a cool tattoo, and you can change the text to whatever you like. 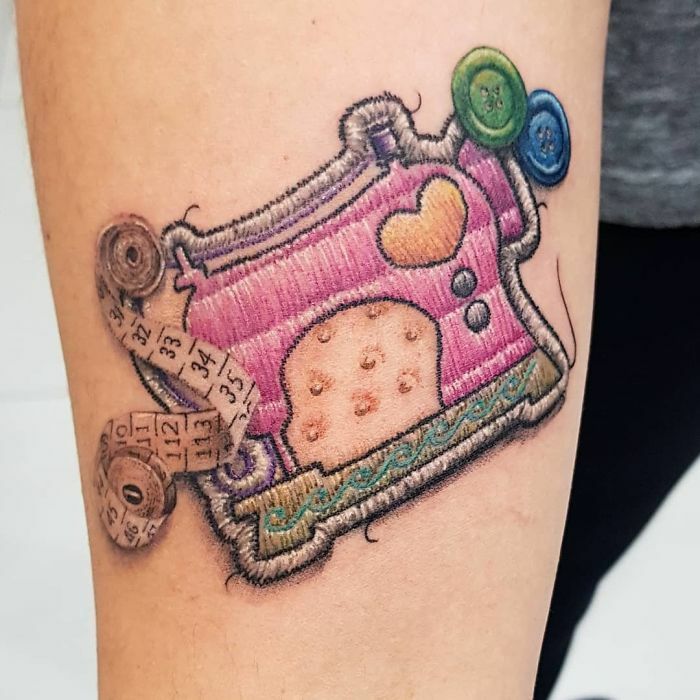 This one is cute and simple, and you can even see the thread and the needle. The little stitches and the color combination make it a little funny but also quite excellent. 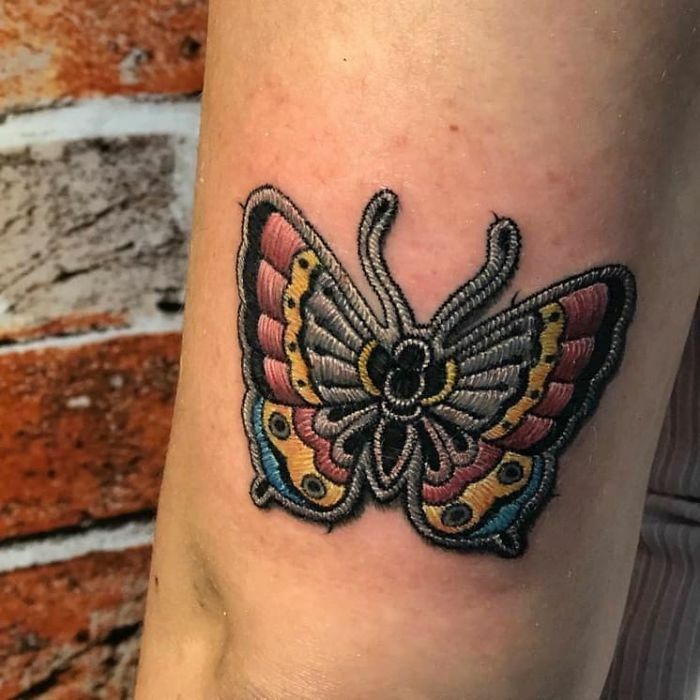 If you are an embroidery fan but you don’t want that style tattooed on your body, you can always choose something a little bit more… graphic like this design. Celebrate your Ukranian heritage with this fresh and cute design. As you may know, every Ukranian region has its pattern, and they also have their own meaning, so choose wisely! Goofy would’nt be my first choice when it comes to Disney Characters, but I can’t deny that it looks awesome in this kind of tattoos. 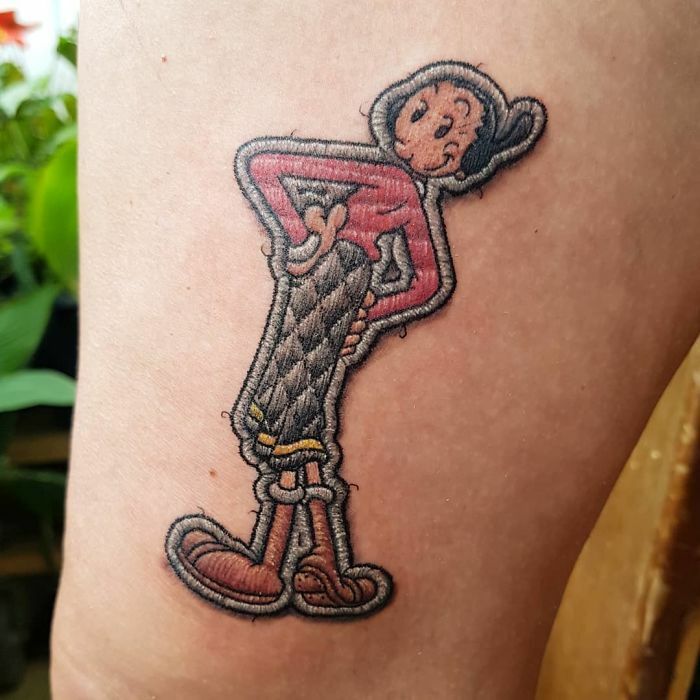 Remember Olive Oyl? She was Popeye’s sweetheart and a beloved character back in the days. 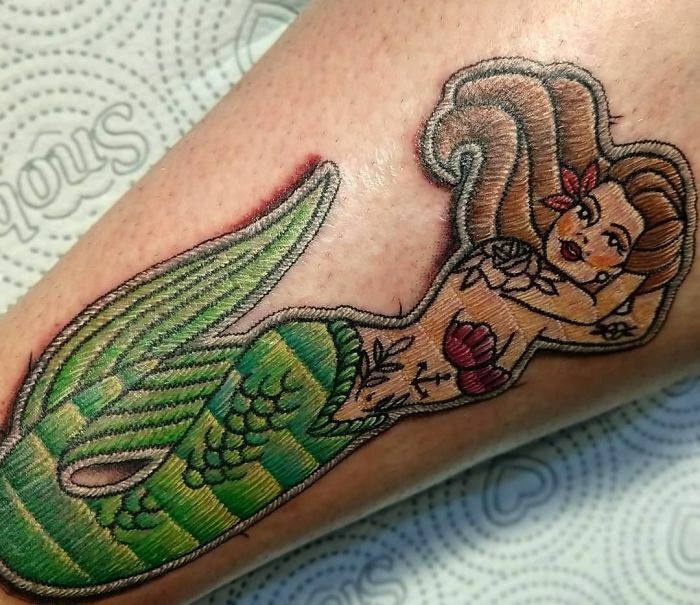 She is now back and in the form of an incredible tattoo. We can’t affirm of deny that this is Popeye’s arm. This may not have that thready look we’ve seen in other designs, but it is definitely part of this collection. It looks like a beautiful pattern you can find in an eastern europe dress. Isn’t this cute? It’s a traditional embroidery, like those you can find in your grandma’s blankets. And maybe this one was exactly that. It is a cool way to have her always with you. You can have your whole leg embroidery with this amazing design. 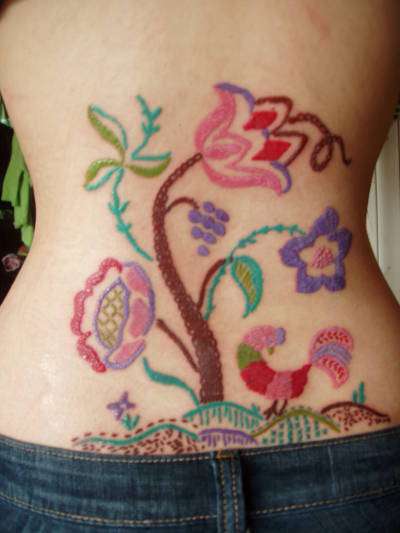 You just need a lot of patience and a talented artist to have this traditional embroidery pattern. 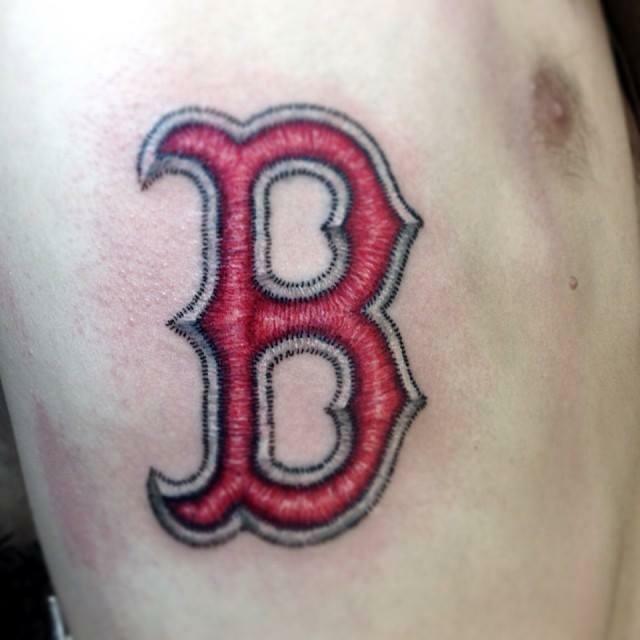 You don’t have to be a Boston Red Sox fan to get this tattoo. Maybe your name is Brian. Maybe you are from Bulgary or maybe you are just a fan of the letter B. This is one of the cutest on this list. And maybe that’s why I kept it for the last. Have you seen that look in its face? How can you make that expression using just a few stitches? Genius.